The registrations for the MOOC on E-guidance in Higher Education to Promote Graduates’ Lifelong Career Development are open from 23 January 2019. 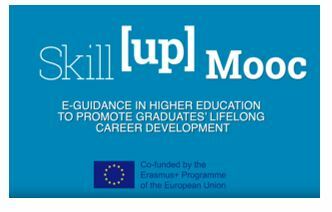 The MOOC is one of the results of the Skill Up project and aims to provide career guidance and counselling professionals with the knowledge, strategies and tools necessary for effective guidance in higher education settings. The course emphasizes the notion of lifelong guidance to develop career management skills, and also the role of ICT in delivering career guidance services. Enroll in the course for free here.